Elite athletes, visual cues, and carp. Jennie Finch is a softball pitcher. A pretty good one. As in "2004 Team USA Olympian with a Gold Medal" pretty good. And, according to an article in the most recent issue of Sports Illustrated, there's not a Major Leaguer on the planet who can hit her. A-Rod. Piazza. Giles. 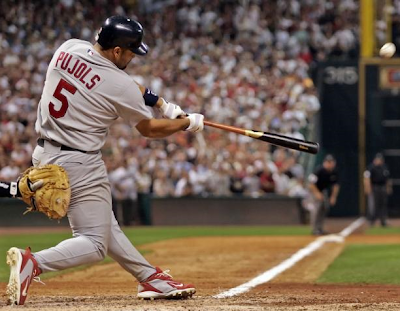 Even Pujols. They all tried. Not one of them could touch her pitches. Bonds managed to foul one off, but only because Finch told him what was coming. Nobody could figure it out. Finch was making the best hitters in the world look like fools. Granted, she's an elite player in her own right and was pitching from a mound 43 feet away rather than the full 60' 6" feet of a big league mound. But then again the softball is a lot bigger than a baseball and was coming in at only around 60-65 mph rather than the 90+ mph routinely seen in the bigs. And these guys, elite baseball players supposedly blessed with elite genetic gifts of extraordinary reflexes and lightning quick reaction times, could not hit these pitches. 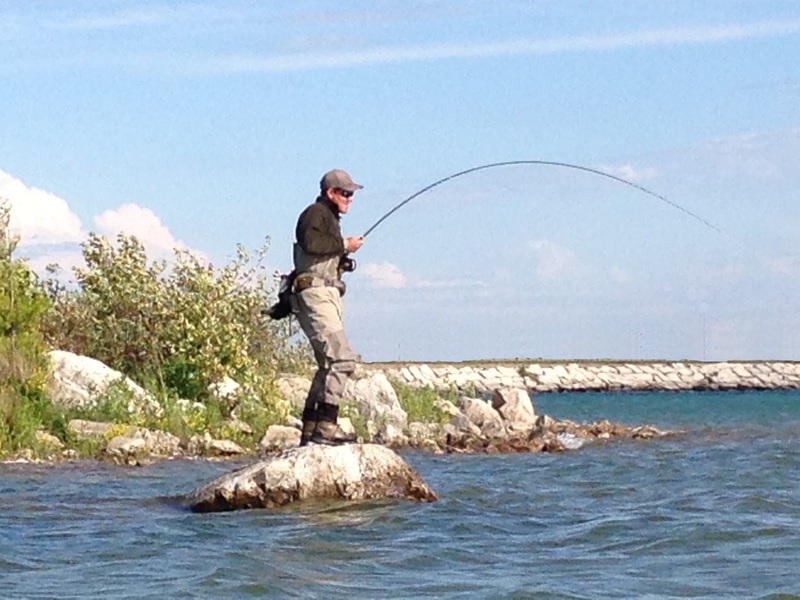 What does all of this have to do with carp and fly fishing? Bear with me here. It turns out that reflexes and reaction times had nothing to do with it. When tested, top level athletes actually had fairly pedestrian scores in these areas and tested no better than the average Joe. Scientific study and breakdown of the process found that the real difference was visual cues. Pujols and the rest of the big leaguers had over years developed massive mental databases of cues that told them what pitch was coming and where it would be when it got to the plate. So a major difference between elite level athletes and the merely average was the ability to identify these cues and make a decision quickly about the action to be taken. To quote the article - "a major league batter has to know where he is swinging shortly after the ball leaves the pitcher's hand - well before it's even halfway to the plate." Subconsciously a big league hitter is reading signs from the pitcher that tell him when and where the bat will need to be. He is effectively seeing into future. These batters couldn't hit Finch's pitches because the softball pitching motion is completely different from the baseball pitching motion. Their databases of visual cues were useless against her. All they could do was react to the ball when their eyes picked it up as it moved to the plate, but by then it was too late. So carp. As I read this article, I kept coming back to a statement John Montana made in a blog post a few weeks ago. He was talking about identifying the take by tail movement of the carp, about which he said "this one kills me by the way...I set the hook all the time on this and not ONCE have I ever really remembered what it actually looked like." I wonder if his memory of this is fuzzy because the tail wag was only one of many cues his brain identified as signals of the take. Maybe the wag wasn't even the main signal that moved him to action. Maybe his brain had already decided at a subconscious level to set the hook before the wag even occurred. I've had a similar experience that I detailed in this post. I knew the carp ate the fly but couldn't tell you for sure why I knew that. I think I saw the fish pause, but couldn't swear to it. But I knew, absolutely knew, that the fish ate. My guess is that this is why anglers new to carp struggle so much initially. They simply don't have the database of visual cues to discern takes. An experienced carper has seen dozens if not hundreds of takes and draws from that experience to pick out the cues quickly. This of course takes time to develop and many fly anglers don't stick with carp after taking a beating or two. Ok, maybe I'm overthinking this whole deal and making connections that aren't really there, but the truth is that visual cues are everything in fly fishing for carp. The higher your skill level at identifying these cues, the more carp you will catch. I think it really is that simple. And this takes practice. Lots and lots of practice. Lots and lots of carp caught. And not caught for that matter.